H. E. President Susilo Bambang Yudhoyono of Indonesia today opened the 13th annual World Export Development Forum (WEDF), devoted to the theme: Linking growth markets: new dynamics in global trade. The President stressed the growing importance of developing economies, and in particular the so-called growth economies, in world trade. Their share of total world exports had increased from 33% in 2001 to 46% in 2011. The share of world trade between developing countries, also known as South-South trade, was expected to double in the next two decade, he said. The President said it was clear that the drivers of global economic growth were increasingly to be found in the growth markets of the global South. The Government of Indonesia was facilitating the development of new export markets for its exporters in Arica, Latin America, Central Asia and other non-traditional markets. Increased trade, economic integration, specialization and the removal of barriers to the movement of goods, services, capital and people was a major enabler of growth and job creation, he added. Improvements in both hard and soft infrastructure are needed, and it is important not to underestimate the value of reforming trade facilitation services such as customs and related enabling services such as ports, logistics, transport and distribution, that are critical to the development of a conducive business environment in general and for the enhancement of international trade in particular. The benefits of trade facilitation reforms are often higher than the benefits accruing from lowering tariffs, he said. The World Bank had found that improving trade logistics by lowering transaction costs and increasing trade speed and predictability could enlarge global trade flows by some US$468 billion annually. In particular, the President stressed the importance of tackling barriers to trade such as non-tariff measures (NTMs), which tend to be higher for South-South trade than for trade between developed and developing countries. He also argued for the integration of small and medium-sized enterprises (SMEs) in developing and least developed countries (LDCs) into global supply chains. SMEs were the backbone of the economies of many poorer countries, he said, and required better access to information, technology, markets and finance. The President also stressed the importance of trade in services, which were not only important in their own right in terms of value added, employment created and export earnings generated, but equally crucial in their impact on the performance of other sectors, such as agriculture, mining and manufacturing. In this context, he highlighted the need to revive trade negotiations under the umbrella of the WTO’s Doha Development Round to reduce barriers, increase trade and economic development. Welcoming delegates to the Forum, Ms Patricia Francis, Executive Director of the organizing agency, the International Trade Centre (ITC), noted that it was taking place at a time of political change in China, on the eve of the United States Presidential elections, against a background of conflict and change in the Middle East, and while the Eurozone was still struggling with a deep economic and financial crisis and growth in industrialized countries continued to be slow. But the news was not all grim, she said, and one of the bright spots was the prospects for growth markets and South-South trade. Although this was not a new phenomenon, ITC believed that this had now reached a tipping point and emerging economies were beginning to diversify their exports towards other emerging economies. A recent ITC paper forecast an annual trade increase of up to 14% in exports from sub-Saharan Africa to Asia over the next decade, even if much of the growth – based on current trends – was due to oil and other commodities rather than value-added processed goods. The challenge for Africa’s policymakers is to maintain the overall growth in exports to Asia, while moving up the value chain towards the export of processed goods. To increase their value added exports to Asia and Latin America, African countries needed to attract investment from these regions not only in extractive industries but also in manufacturing and integrate into value chains of major multinationals based in these regions. Ms Francis added that sustainable growth of South-South trade would require investments in new capabilities, measures to improve trade facilitation, infrastructure and trade finance. Expansion of growth markets had the potential to revolutionize world markets in the same way that trade between developed nations revolutionized markets in the 1950s and 1960s. The South needed to become a real partner rather than a bystander in the process. “We know that trade benefits everyone, and now we have an opportunity to create a new model, one that breaks the cycle of dependency, is inclusive of women and the poor, and creates real and long-lasting partnerships", Ms Francis said. Indonesia’s Minister of Trade, H. E.Mr Gita Irawan Wirjawan, responding on behalf of the host country, noted that the OECD expected that while the developed world accounted for about 60% of the world’s GDP in the 1990s, this would be reversed in less than two decades: Emerging countries would contribute 60% of global GDP by 2030, and Indonesia, as a trillion dollar economy, would play a major part in the transition. He said there were four key elements that would require a cohesive and prudent policy approach. These are: recalibrating the global trade focus; finding new ways to further integrate growth markets into global trade; improving competitiveness and connectivity; and distributing the benefits of closer economic integration fairly. 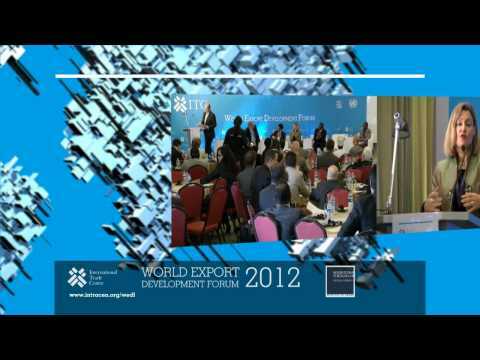 If countries could overcome the obstacles in areas to be discussed during the WEDF such as infrastructure development, trade facilitation and connectivity, strengthening supply chains, adding value and meeting the demands of emerging consumers in growth markets, and trade finance, it would be possible to achieve efficiency and inclusive growth with positive spillovers beyond borders.